One issue that many of our readers run into when trying to eat at home to save money is the fact that making dinner takes so long. What if we could tell you that you can make a number of meals by prepping-ahead in just a few minutes, store in your fridge, and then dump on a pan and bake in 8 minutes…would you be more likely to eat at home? Well, that is what we want to show you today! There are dozens of recipes meeting all types of diet requirements that allow you to prep-ahead five meals at one time, store in ziplocs in your fridge and then when you are ready to make dinner, dump it on a pan and bake for just a few minutes. 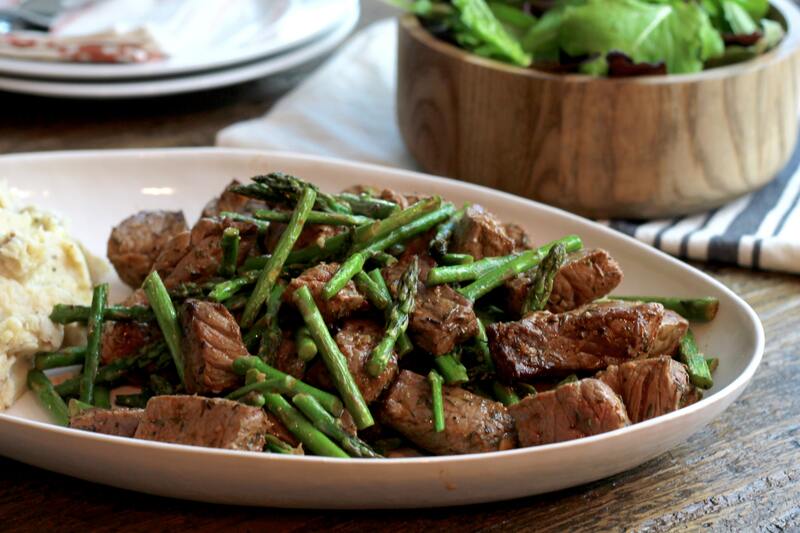 You can check out these prep-ahead, one-pan meal plans HERE. In fact, this meal is Prep-Ahead, One-Pan, 8-Minute, Broiled Spicy Steak and the prep only takes about 5-10 minutes. Then once you are ready to serve, simply bake for 8 minutes! This means that you probably won’t have the table set before dinner is even ready. That means you can make a homemade meal faster than the drive-thru or going out to eat. It will save you time, money and health by eating at home. 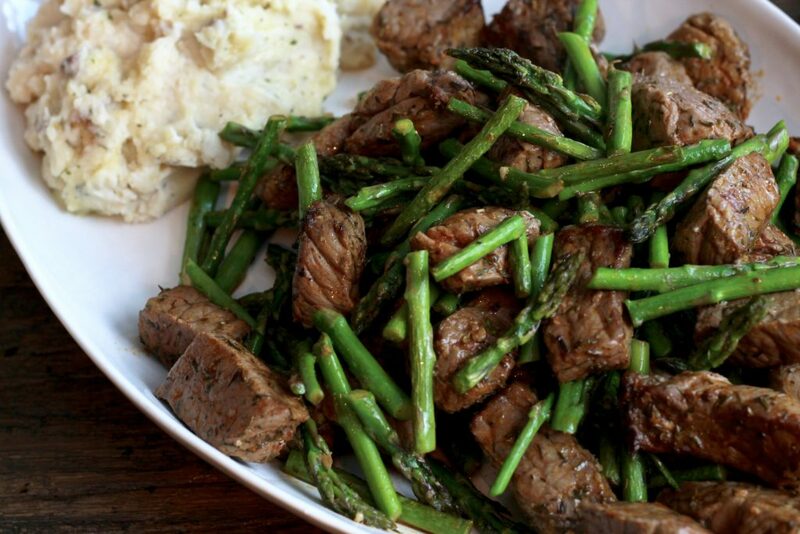 We are in love with these prep-ahead meal plans! Most of them use chicken, beef, pork or fish – all of which you can buy direct from the farms for a fraction of the price and get higher quality for 30-50% less than the grocery store. Order the meat ahead in bulk to store in your freezer, then make the prep-ahead meals once each week and then you have dinner in no time! 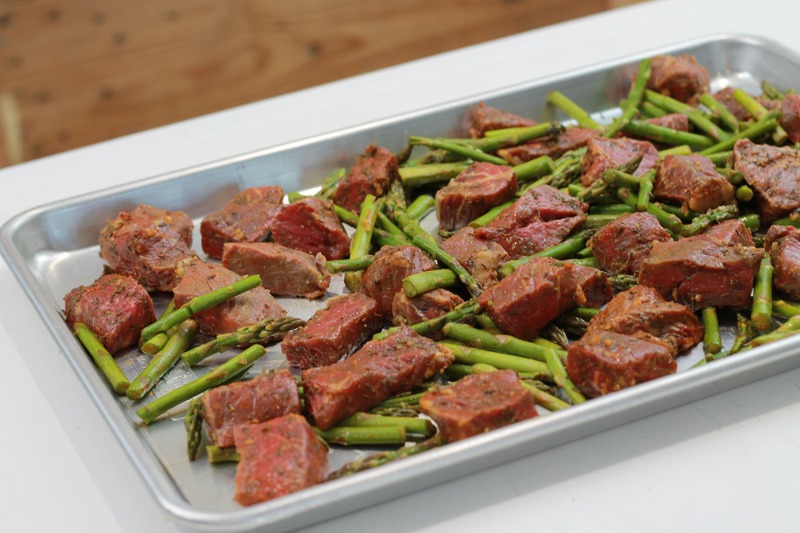 We want to start by sharing Prep-Ahead, One-Pan, 8-Minute, Broiled Spicy Steak. This recipe will make the meat lovers in your house, skip around the room in a happy dance. This recipe is shared by my friend Michelle, who makes all of these amazing one-pan meals to make it easier to eat at home. Simply cube up the steak and toss it in a bag. Add the rest of the ingredients and give the bag a good shake to coat all the meat with the yummy bursting flavor of the spices. When you are ready to cook, pour it on a baking sheet and broil it for 4-8 minutes depending on the desired doneness. Fridge to the table in 8 minutes…BAM.. you’re now a dinner rock star. If you aren’t wiping the drool from your chin by now, you are just not human, and I don’t think we can be friends. If an 8-minute dinner looks this good, can you imagine how good it TASTES! You can’t lick the screen to find out but I bet you want to. Get the printable recipe HERE! Add first 6 ingredients to the large zipper bag. 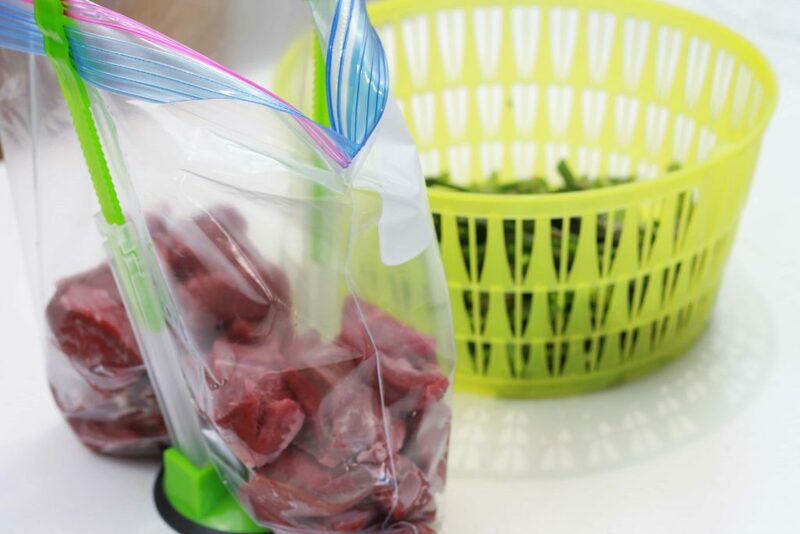 Cut steak into 2-inch pieces and add to the same bag. Zip to seal and gently squish around to mix. Trim woody ends off asparagus and discard. 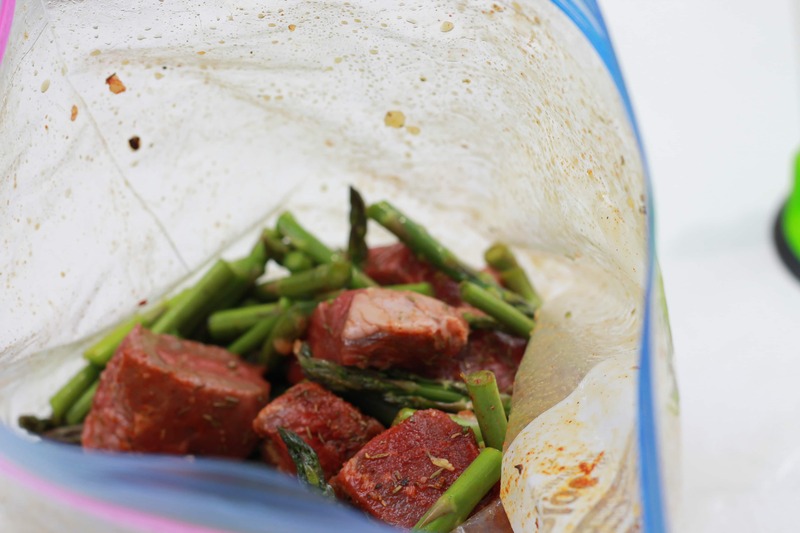 Place asparagus spears in another large zipper bag with last 2 ingredients. Zip to seal and squish around to mix. 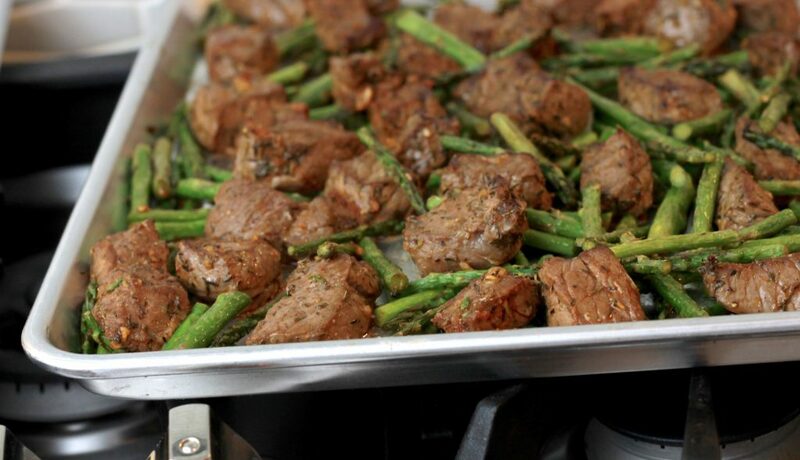 Pour steak bites and asparagus onto large baking sheet sprayed with non-stick spray. Broil 4 – 8 minutes or until desired doneness. Cook mashed potatoes according to package directions. This recipe was so easy and it turned out perfect and tasty as well. Get a Deal on Our Book Now!